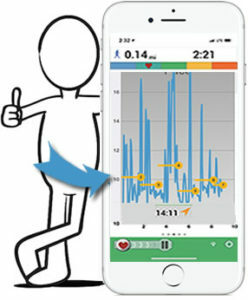 Fitdigits apps have many fun, interesting and helpful graphs and maps as you swipe or tap through the program, both in-workout and post workout. It only takes a minute to learn a few tips and tricks and get the most of these features. Their are a few basic things to remember when working with maps in the workout. Tap the lock in the upper left to unlock the view. After unlocking you can pinch in or punch out using your fingers to get zoomed in or out, or touch and drag for other views. Double tapping will zoom in, even if the lock is locked. Double tap again to zoom back out. Tap the Satellite option in the top right if you prefer a more realistic view of your area. Tap Map to go back to the generic map view. Tap Lap in the bottom right to see markers where the app set auto-laps based on your settings or where you marked a lap yourself. Tap Distance to see markers at 1 mile or 5 miles depending on the activity type (bike or run/walk orientation). The same basic principles of Maps also work with the graphs, except there is no lock button on these. What graphs you see will depend on the sensors you have active and tracking, and can include heart rate, steps per minute, cadence, power/watts, speed/pace and elevation. On iOS, we’ve added trend lines and current readings to our graphs. The trend line shows your average over a particular ongoing lap. A great way to easily judge your averages over each lap, and keep yourself on target! A personal favorite feature, for sure. Your mile averages going down or up? You can see it easily with the yellow average lines, and keep yourself going the way you want to go. We did our best to pick the best metrics to show above the in-workout maps and graphs, but not all people have the same ideas, and neither do we. It can also change. If you want to change the metrics that show on your version, see this post on Settings & Chart and Map Metrics (iOS). Post workout maps and graphs work very similarly to the in workout versions in terms of double tapping to zoom in or out, pinch or punch with your fingers to custom zoom, and even the lock icon on the maps screen. To get back to a base view, just keep double tapping on the center of the view, it will eventually take you back to the main default zoom level view.